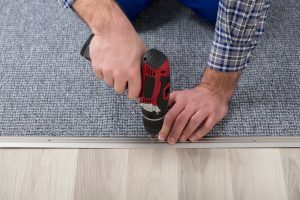 From the special tools you need to use to the expertise needed to correctly install the carpet padding, trying to replace your carpet on your own is a difficult process that can easily go wrong if you don’t know what you’re doing. For this reason, the best option for having new carpets installed in your home is always to have a professional carpet installation team do the job. Not convinced? Continue reading to learn four reasons why you should leave the job to the professionals. Most people don’t have carpet knives, knee kickers, and power stretches just lying around their house. There are a wide variety of tools you will need to own and know how to use in order to install a carpet. The carpet installer will already have all these tools on hand and have the expertise to use them correctly. There is a lot that goes into preparing your floors for carpet installation including removal of the old carpet, taking out baseboards, and possibly installing new subfloors. If you miss any steps or don’t know how to determine if your subfloors need to be replaced, you will set yourself up for problems later on in the process. If you incorrectly cut, install pads, or stretch your carpet, you will certainly notice bumps and other flaws when the job is done. Ensure your carpet looks great by having a professional make sure the job is done right the first time around. Mistakes made during the carpet installation process can easily go undetected until problems arise later on. In addition, there might be an issue with the carpet you purchased. If you installed the carpet yourself, the warranty might have been voided. While you might be tempted to save money by installing your carpets yourself, carpet installation is a complicated process that can easily go wrong. To ensure a job well done, contact a professional right away.